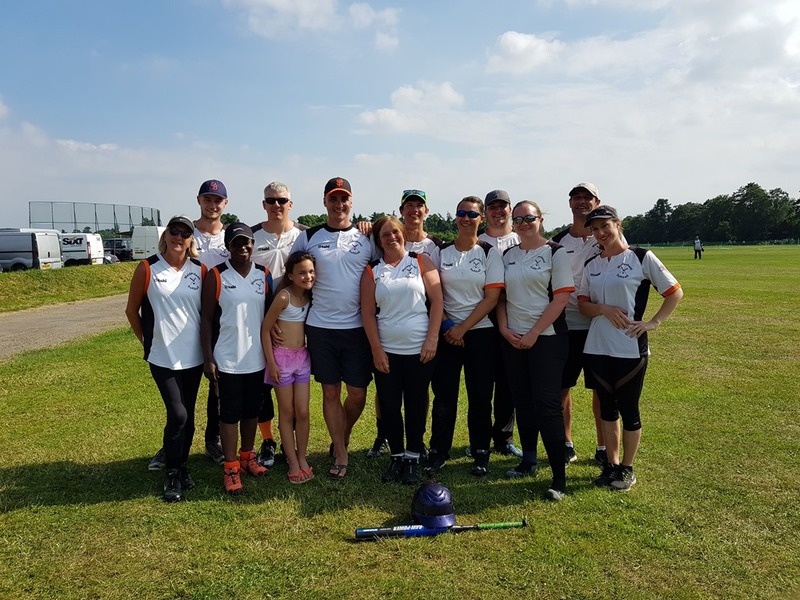 The London based PSL All-Stars won the recent Hit and Run 6 Softball tournament, Maidenhead’s only multi-team Softball event. 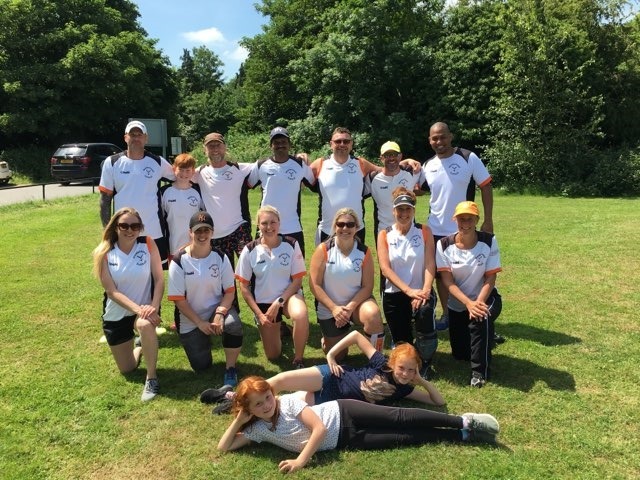 The event hosted at North Maidenhead Cricket club and run by Maidenhead Softball club is an annual 8 team event is aimed at helping developing teams provide game time to new players. This year, along with four local based teams, there were 2 London based teams, one from Hertfordshire and one from Eastbourne. The first half of the day saw the 8 teams compete in a round-robin format and from the first games it was clear the days front runners would be PSL All-Stars and RG Blue Sox. Both completed their group stage program undefeated and thus avoided each other in the Cup Semi-finals. 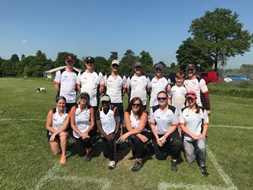 London based Hotel team COMO, secured the third Cup semi-final space with a win in their second game and would meet the Blue Sox, while the final Cup Semi-final place would be settled by a local derby between Bracknell Scorchers and TV Hurricanes. Scorchers won that encounter to set up a game against the All-Stars. The Plate competition saw Maidenhead’s own Rascals team face Herts Buzzards in the first semi-final. After a tough start for the Rascals, they finished the group stages with a draw against the Eastbourne Bombers. The Cup semi-finals saw the local teams fair very differently. The Scorchers found the All-Stars too strong and went down 30-1, the Blue Sox had a much tighter encounter and just overcame COMO 12-11 to set up the final that looked on the cards from the start. 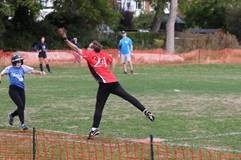 The Plate semi-finals saw both local teams overcome their oppositions, Rascals beating Buzzards 21-9, Hurricanes beating Bombers 14-2. The Rascals have been perennial Plate finalist over the 6 years of the competitions, but have consistently fallen short, and 2018 was another instance of that as the Hurricanes, who only just missed out on the Cup competition, winning 18-8. The Cup final was an encounter that was a fitting end to the day, both teams unbeaten on the day and both playing well. 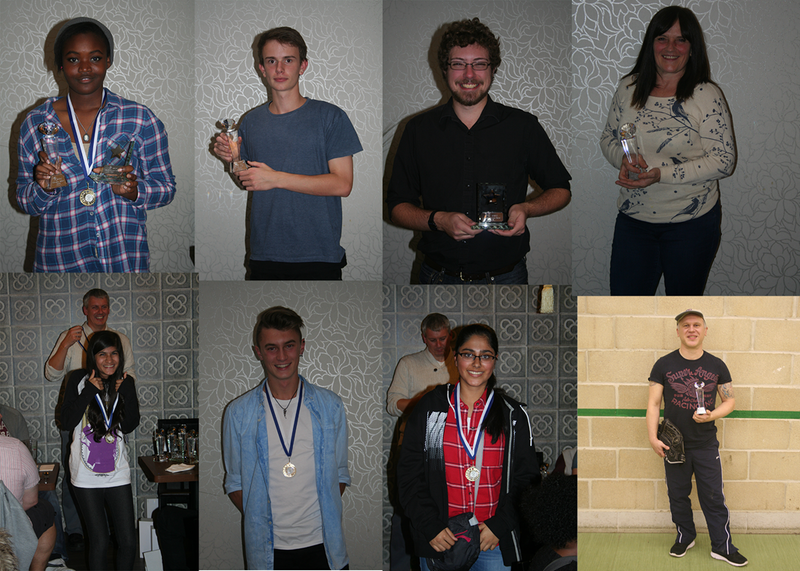 The was also a first appearance in the Cup final for both teams, the All-Stars had been Plate runners-up last year. This year, they took the next step to Cup winners as they squeezed past the Blue Sox 12-9. The standard of play and popularity of the event have gone from strength to strength over the past 6 years and looks to continue next year, now with a new winner’s name on the Roll of Honour. 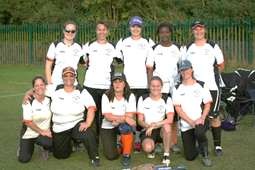 For more information about Softball and how to get involved in the Maidenhead area contact MSC on maidenheadsoftballclub@outlook.com. 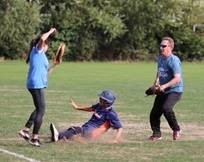 This entry was posted in Hit and Run, Season Review, Tournaments and tagged Hit and Run, Season Review, Softball on October 4, 2018 by maidenheadsoftballclub. It was a good weekend for the two MSC team playing in B Grade at Diamond 2. Both teams finished inside the top 6. For the Rebels this was a huge step up from Diamond 1. The Royals improved their standing from Diamond 1 by 1 place with a 3rd place finish. 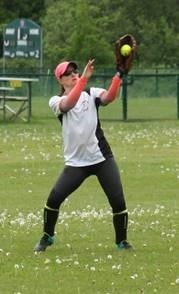 The Rebels failed to win a group game at Diamond 1 and faced a tough opening game against the Oxford Angels. In a hard fought game, the Rebels came out 11-10 winners to record their first win at this level and get off the the perfect start on a day that would see them play 6 games. The Royals started the day against The Mob. Neither team had played each other in the first event, so this was the first encounter of the season for both. Like the Rebels this one went down to the wire with the Royals coming out winners 8-7. So, with winning starts for both teams confidence was high for the next games. Both teams faces opposition they had meet in Diamond 1, Rebels face Bristol Monkeys whom they faced in the knockout phase and had beaten. Royals faced Pyros, whom they meet in group play and had narrowly lost to. History repeated itself. The Rebels won easily the Royals again lost by 1. The Rebels were enjoying an excellent run and would extend that run as they faced and beat TV Typhoons. With a record of 3-0, the Rebels now faced the hardest part of their day, The odd schedule meant they would play 3 games in a row. After that, their worst result of the day would be eliminated. Three games in the heat of Saturday afternoon was a lot, and while they came close against Ducky Fuzz but the winning streak came to an end here. Next up the London Raiders, who were too strong in the batting line up for the Rebels. This was their biggest defeat of the day and would be the result that would be discarded. Going into the last game against Dodgers East the Rebels were are 3-2. But this was a game to far and a third lose did take a little shine off the day. However, with an overall record of 3-2 this was a vast improvement over Diamond 1 and was good enough to qualify for the Cup competition on Sunday. The Top four all meet. The Royals afternoon was equally as tough as the Rebels, but in relation to opponents rather than game timing. The Top 4 from Diamond 1 were, Pav’s Knicks, Misfits, Spitting Camels and Royals. All four were in the same group and the Royals had to face al three starting with the Misfits. The Royals had played the Misfits twice in NSL 2 and once at BA last season and managed only 1 win. This was the first encounter this season and the Royals came out on top to improve to 2-1 on the day. Next up came Pav’s Knicks for the 4th time this year, The were Royals leading the overall series 2-1, but had yet to beat the Knicks at Diamond event. That was soon put right and whereas the Semi-final at Diamond 1 was a disappointing performance from the Royals, this was more like the norm. Good defence and excellent offense saw the Royals over the line and improve to 3-1 on the day. With a top 3 finish in the group just need to qualify for the cup, the Royals were in strong position with one game to go. Diamond 1 had started with a lose to Spitting Camels, unfortunately Saturday at Diamond 2 ended the same way. The Camels again proved too strong offensively and left the Royals 3-2. That was good enough to make the top 3 and a place in the Sunday Cup competition along with the Rebels. The Top 3 teams in the two groups from Saturday formed a new group for the Cup competition on the Sunday. Teams in this new group played a cross over schedule against the teams from the opposite group to the one they were in on Saturday. This meant the Royals and the Rebels would meet in a Tournament at B Grade for the first time. With only the top two in the Cup group making the final and only 3 games it was critical to get a good start. As you would expect when two club teams meet, there was banter, nerves and some great plays. On this occasion it was the Royals who came out on top 8-5. It made the Rebels chances of a final spot extremely slim. That didn’t stop them putting it all into their remaining two games. They would face the No. 1 team and No. 3 team from Diamond 1 in Pav’s Knicks and Spitting Camels. Unfortunately neither game went in the Rebels favour and they would end the day bottom of the cup group. While that sounds a poor result, to come 6th from 16th in Diamond 1 is a huge improvement and tribute to how the team adapted to the higher level they are playing at this year. After victory in the derby match, the Royals were in a good position to to make the finals, next for them where the winners of the other group from Saturday, the London Raiders. This was a different encounter for the Raiders compared to their match against the Rebels the previous day. In the end, 1 run in the last inning settled it in the Raiders favour. The result dented the Royals chances, but with one game to go and the other teams at the top all playing each other it was getting tight. Last up for the Royals were Ducky Fuzz. The two had clashed in the quarter final at Diamond 1. The Royals won that encounter by some distance. This time around it was a much closer affair. Having already been in 3 games settled by fewer than 3 runs, it wasn’t a surprise that this one went the same way. The Royals edging the game by two. With both teams having finished their programs the wait was on. Rebels lost all 3 games and were out. The Royals had a chance thanks to their defence on the Sunday. With one more round of games, The Royals were hoping the London Raiders could beat the Knicks or at least score 11 runs. In the end neither result happened and the Royals were left 3rd missing out on the final by a couple of runs. A 3rd place finish was an improvement on Diamond 1’s 4th place and there were lots of positives from the weekend. Pav’s Knicks went on to win the Cup and are in pole position for the series. For the Royals to win the series now, they will have to win Diamond 3 and hope Pav’s fail to make the top bracket. Regardless of whether that happens, this has been a fantastic Diamond series and sitting in the top 3 and a chance of a runners-up spot is the result performance at B grade by the team. it will be a long wait till Diamond 3 at the end of July. 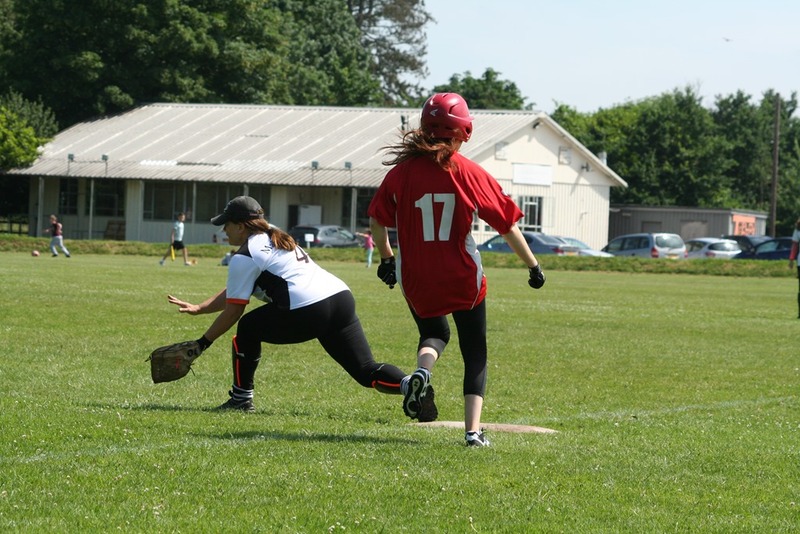 This entry was posted in Diamond 2, Diamond Series, Rebels, Royals, Tournaments and tagged Diamond 2, Diamond Series, Rebels, Royals, Softball, Tournaments on June 13, 2018 by maidenheadsoftballclub. The Maidenhead Royals began their quest for the 2018 Diamond Series championship over the weekend of May 19th and 20th. Following the disappointment of relegation from NSL 2 last year, the Diamond series represents the first steps in trying to gain promotion back this year. The Diamond series runs over 3 weekends during the summer. Teams compete for the individual event titles, but also the series championship. The Royals are back in the “B” Grade competition and are looking for a high finish in the series. The “B” Competition this season consists of 16 teams who are divided each event into two groups of 8. The teams play each other once to determine places and who progresses to the Cup and Plate competitions. The Royals were drawn in Group 1, along with Spitting Camels, TV Typhoons, Bristol Monkeys, Nottingham Pyros, OAPs, Dodgers East and London Flames. The day didn’t start as well as the Royals had hopped. In a very tight game, they fell just short 9-7 against the Spitting Camels. Game two was a local derby as the Royals faced the Typhoons. Both teams had just meet in the opening week of WMSL League season, and this encounter was their 3rd so far, having also played in the WMSL First Ball competition. The Royals ran out 22-2 winners. That doesn’t tell the story, the Typhoons had the misfortune early on as they lost their right fielder, Sam Croft to what turned out to be a broken hand. We wish Sam well and speedy return to the diamond. The Royals were making hard work of their group games, and OAPs, didn’t make it any easier. This game went right to the final minutes of the game and a Home Run by Dom Shepherd drove in the winning run as the Royals came from behind to win 9-8. The Royals weekend was series of outstanding batting games followed by a drought. Against Bristol Monkeys, the runs poured off the bat. 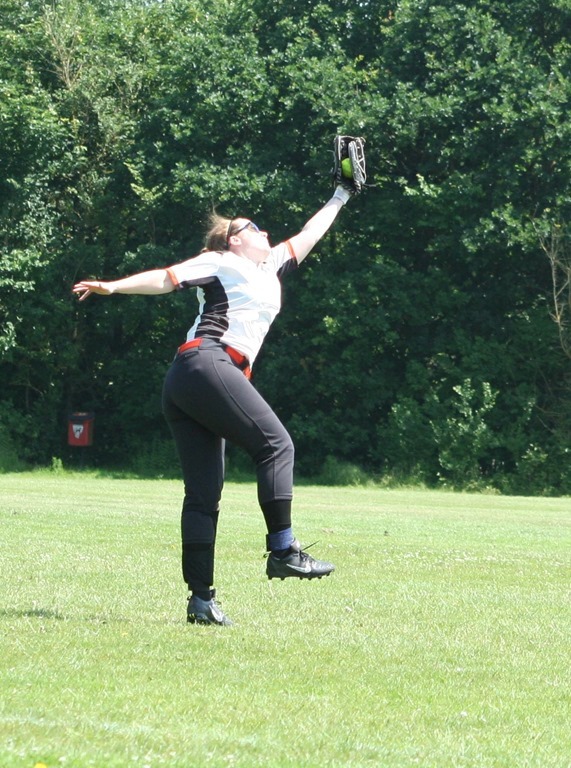 The 24-5 win was the third in a row and set up the final game of the day against the Nottingham Pyros. Late on Saturday, the Royals wished they could have some of the runs from the previous game as a dogged Pyros teams kept edging in front every time the Royals seemed to have got ahead. In an almost identical finish to game 3, it was the last hit of the game that sealed it, unfortunately it was a Pyros hit and they edged the game 9-8. The Royals started very early on Sunday against Dodgers East. Both teams starting the day 3-2 following Saturdays games. It was the Dodgers who woke first raced into an early lead, the Royals rallied and won their fourth game of the competition 10-5. The last group game was against a familiar foe, the London Flames. The two teams have met in some epic encounters over the years in the Diamond tournaments. This latest encounter will be added to the list. A back and forth encounter again went to the wire, with the Royals coming out on top 13-11 as the Flames just feel short in the last inning. Their 5-2 record put the Royals in the Cup competition following a 3rd place finish and encounter with Ducky Fuzz in the Quarter final. Ducky Fuzz came into the game as the higher seed, but from the off the Royals demonstrated how potent their offense had been at it’s best on Saturday. Two huge innings against a fading opponent saw the Royals into the Cup Semi final with a 24-4 win. The Semi-final was a rematch with Pavs Knicks, a team the Royals beat twice in the WMSL First Ball competition, including victory in the final. The game was the mirror opposite of the Ducky Fuzz game, with the Knicks on the front foot from the start and the Royals could not get anything going at all. As with Saturday, the batting deluge in one game was followed by the drought in the next. So, the day belonged to the Knicks who ended the Royals quest for a Diamond Cup title, with a 15-7 win. The Knicks would go on to win the Cup themselves and will be a force to be reckoned with over the summer. A top 4 finish was a very good return to the Diamond series. In Diamond 3 last year the Royals fail to win a game, so 6 wins and 3 defeats over the weekend was a real morale boost and keeps them right in the hunt for the series championship. The Royals now look forward to Diamond 2, which starts on June 9th, with real optimism. 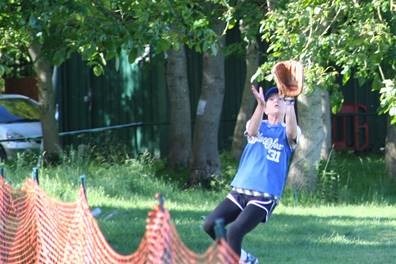 This entry was posted in Diamond 1, Diamond Series, Royals, Tournaments and tagged Diamond 1, Diamond Series, Maidenhead Royals, Softball, Tournaments on May 23, 2018 by maidenheadsoftballclub. 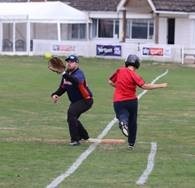 Sunday May 21st saw the second running of Maidenhead Softball Club’s “Chicks with Sticks” tournament. This year 8 all-female teams compete in this one day event, with three new teams entering, RG, TV and Bracknell Scorchers, to complete alongside returning teams from 2016, No Balls, Lady Heath, Portsmouth Dodgers, Sticky Chavs and MSC’s own female team, Diamond Squeezers. 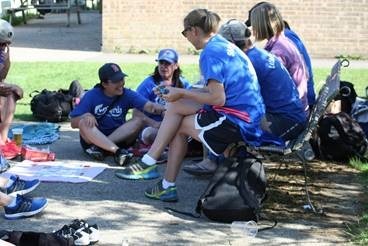 Under glorious blue skies, these 8 teams found out a series of round-robin games, to determine the Cup and Plate competition. The competition was hard, but friendly, hitting and fielding that even surprised the resident Cricket team, as well as spectacular catching, made more interesting with fencing on both fields. Group 1 was won by No Balls, going undefeated, from Lady Heath, Diamond Squeezers then Bracknell Scorchers. Group 2 saw Portsmouth Dodgers pip Sticky Chavs thanks to a final group game win over their rivals. RG came third ahead of TV as the two fought out a 3-3 draw in their final game. This was first draw in CWS history. 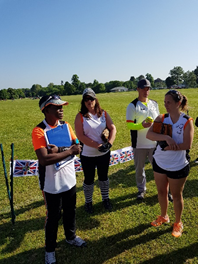 The post group stages worked out along the experience lines, with the three new teams, plus Diamond Squeezers making up the Plate competition, while No Balls, Lady Heath, Portsmouth Dodgers and Sticky Chavs. The semi-finals of the Cup competitions started with Portsmouth Dodgers taking on defending champions, Lady Heath. Lady Heath were determined to defend their title and put on a good performance to book their place in the final with a 24-12 win. The other semi-final pitted Sticky Chavs against No Balls. This was a very tight game that could have gone either way, in the end No Balls came out on top 15-12. The plate semi-finals saw all the local teams face off as TV took on Diamond Squeezers and RG take on Bracknell Scorchers. It was heart break for the host club team as TV beat the Squeezers 5-4 to set a final showdown with RG who shut Bracknell out 8-0. The Cup competition was a repeat of the 2016 final, No Balls overcame Lady Heath 17-10 to gain revenge on their one run defeat in 2016. The Plate Final saw two of the new teams, RG and TV fight out a close game, with TV finally winning 10-9. The aim of the day is to provide an opportunity for the female team to play out a fun, relaxed but competitive day of Softball. Although Sticky Chavs did find way to relax between games and it wasn’t talking tactics. C.W.S 3 will be back in 2018, will we have our first repeat Cup winner or will someone else break the monopoly No Balls and Lady Heath have started? 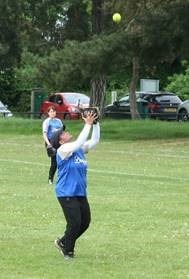 This entry was posted in C.W.S, Diamond Squeezers, Tournaments and tagged CWS, Maidenhead Softball Club., Softball on June 5, 2017 by maidenheadsoftballclub. Club Review of the Year Part 12. The End of one Year, Start of Another. So we’ve come to the final part of our journey through 2015. Over the last 22 days and 11 parts we’ve tried to convey the highs and lows of the year. So as 2015 draws to an end and we look forward to 2016, we can take one last look at the fond memories of this year. My personal favourites moments both came against London Flames at the Diamond Series, sorry London Flames. Our two encounters in 2015 Diamond series were both epic. The only regret about them was that so few people actually got to see them, especially the Diamond 2 final. But enough from me, let’s celebrate the winners ones last time before we look ahead to 2016. Congratulations to the players, Giannah, Julia, Natalie, Alex, Evan, Grant and John “Eddy”, the 2015 Club MVPs and MIPs. To the teams, the Royals team that came top of the tree in the Diamond Series, the Rebels team who won at BA, the development team that came so close at the Raiders tournament. The Marlovians for their best league finish. To be honest, everyone was a winner in 2015, it was that kind of year, everyone played a part in all the successes. Let’s not forget the other events. The past 11 posts focused on the main events of 2015, but the club did enter other events and did well in those too. The first outing outdoor was a trip down to the south coast to the Chichester Charity event and out outdoor year started as Plate Winners. That was soon followed up with a Runners-up slot in the Plate at GB Open. We played at MLB and Leicester Labour day, without success this year. The last honour of the year can in the last main tournament where we reached the Cup final of the Windsor Last Ball event. Sadly that ended in defeat, but was the gauge for what will come next year. 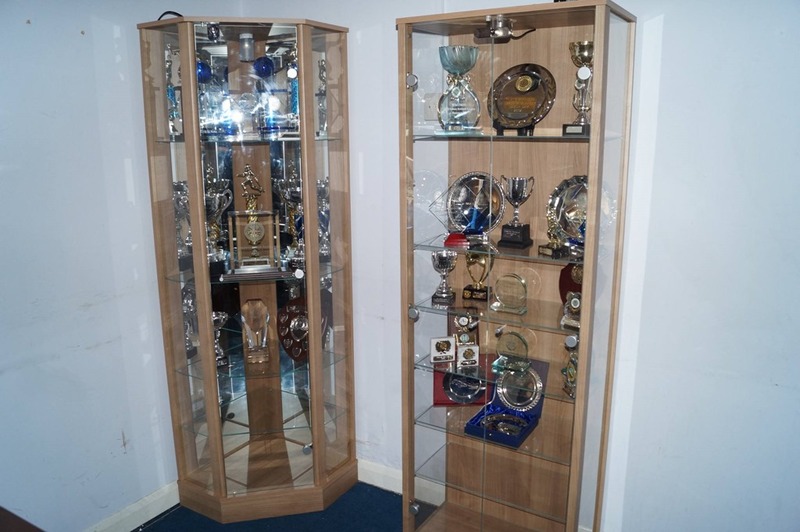 All those events have helped fill the trophy cabinet we finally got installed this year. 38 different honours spanning 15 years. The club history on permanent display in the club house at our own ground. To get this point we needed to collect the spoils from all those years. Without a home before, the trophies have spend many years hidden away awaiting the cabinet. So we reached out to past members who helped build the foundation of this club, they helped us fill in a number of gaps we had in our history and the gaps on the shelves too. It was not just trophies they provided, but cuttings and photos. So it was interesting to see that the earliest photos we have show the club playing in white, we spent a long time playing in blue before switching to white a couple of years back, a decision that now harks back to those early days. The indoor season is nearly upon us and a time when we try and blood as many new players as we can in preparation for the outdoor season. The club plans to make the step up in grade this year. The tournament Royals team will play in B-grade and the Rebels team will be the primary C-Grade team. It will be tough, especially for the Royals, but a step that is needed to keep developing the club forward. The ladies team will be invested in, both in training time and tournament entry. The club plans to hold an all-female event in May 2016, something we’ve been planning for a couple of years in conjunction with Hit and Run, which will be back for a 4th year. The Newlands satellite will continue and be the corner stone of the development program for all ages. We also hope to start of improvements to our home ground, that will be a long process but worth the journey. It will be sad to say goodbye to 2015, we had a such a great year and will be fondly remembered. Now we look ahead to making 2016 even better. The review of the year in full. This entry was posted in Awards, Club News, Diamond 1, Diamond 2, Diamond 3, Diamond Series, Hit and Run, Indoor League, League, Most Imporved Player, Most Valuable Player, Rebels, Royals, Satellite Club, Season Review, Tournaments, Youth and tagged Diamond Series, Satellite Club, Season Review, Softball on December 24, 2015 by maidenheadsoftballclub.